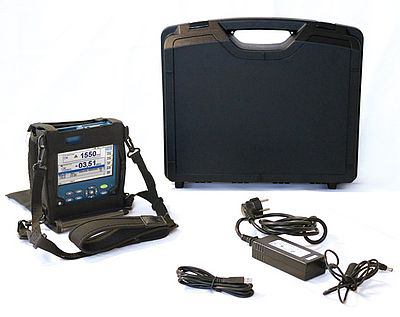 A special carrying case with shoulder strap allows for a hands-free operation and eliminates the need to mount the measurement tool testing. The results are displayed on the 5 inch touch screen and can be analyzed and saved conveniently. Featuring an automatic event detection, all events on a fiber optic link are automatically displayed with a Pass/Fail evaluation. Additional measurement functions such as attenuation measurement and an optical power meter provide for an accurate measurement of the total link loss and of the output power of active equipment such as switches. The optional fiber inspection microscope enables you to document the quality of the connector end-face after installation. This is a helpful feature, especially in instances of faults or warranty claims.